Our tent stakes have a galvanized layering in order to protect from possible rust. What this means is that you will not have to worry about your pegs rusting after a week of use, which is the case with many other pegs. We understand that a product made of steel should not be something that can be used for only one hiking trip. We took this into account and made sure that our stakes can be used over and over, with each new coming adventure. We choose quality. Our stakes are not only galvanized - they also handle pressure extremely well. Creating good tent stakes is not exactly rocket science, yet so many of the sold stakes are good only for one-time use. We chose the optimal length for our stakes, which ensures that they won't immediately bend when inserting them into the ground. They can easily withstand the applied pressure. Again, we know that no one wants to pay money for a product that easily bends or breaks. We made sure this is not the case with our product. This saves you lots of money and removes the hassle of buying more pegs for your tents and gardens. 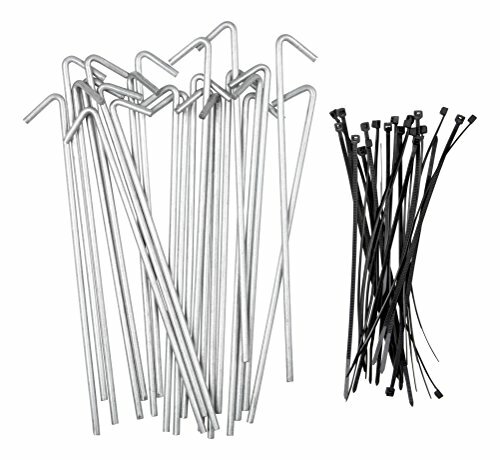 Our 50 tent stakes come with 50 cable ties as a thank you for choosing our product. As a thank you to our customers for choosing our product, we wanted to include something into the package that you may need when hiking or working outdoors. From experience, we see that our customers often purchase cable ties to hold together various items in the their yards and gardens. As a result, we thought to ourselves, why not then supply the cable ties with our stakes? We truly hope that we and our products are able to serve you well. If you have any questions about this product by Stepton, contact us by completing and submitting the form below. If you are looking for a specif part number, please include it with your message.